The Warren County Historical Society is printing a 2nd Edition of the 1993 book of photos, Windows on Warren County’s Past. It will be available for purchase in September at the museum for $25.00. 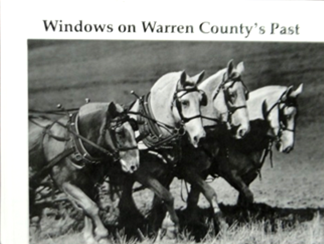 It will be a wire spiral book containing over 250 black and white photos of Warren County’s heritage, including the famous photo, “Cadence on the Plow”, which was taken by Don Berry, former publisher of the Record Herold and Indianola Tribune. The book includes pictures of early Warren Cunty businesses, communities, churches, schools, families, sport teams, bands, farm life and other events. The Record Herold and Indianola Tribune and over 100 persons contributed photos and information for this book. If you did not purchase one in the 1990s, this is your chance to buy one. It would also make a great Christmas or birthday gift for loved ones. The 2017 LCDF Book, Patriotism, Courage & Sacrifice, is being printed and can be purchased at the WCHS museum for $45 when available. Add an additional $5 if you want it mailed. 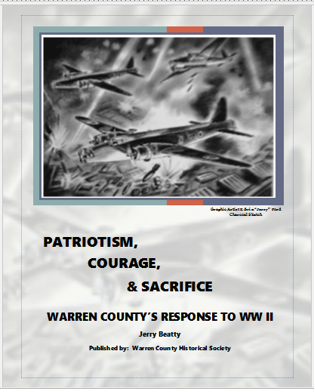 The Warren County Historical Society has published a 400-page book entitled: Patriotism, Courage & Sacrifice: Warren County, Iowa, Responds to WW II written by award winning author, Jerry Beatty. The book lists over 3,200 service members, who lived at any time in Warren County, and includes service and biographical information on most of them. The book contains over 800 pictures of Warren County service members and others who served the nation on the home front and abroad. The study was based on over 100 taped and in-person interviews as well as memoirs, family histories, and other materials. The index contains over 7,000 names. The book is dedicated to the 102 Warren County men who lost their lives during WW II fighting for freedom. It also honors all veterans who wore the uniform and the people back home who supported their efforts by producing the food and materials necessary to win the war. The study outlines the events leading to WW II and examines the participation, sacrifice, and contributions of Warren County service members. Thirty Warren County servicemen were captured and endured the hardships of German and Japanese POW camps; 2 died aboard Japanese transport ships sunk at sea. The book highlights numerous activities on the home front including: war bond and stamp sales, rationing, salvage drives, conservation, civil defense, and the efforts of various groups and organizations, including the Red Cross, to provide quilts and other garments to American troops and relief to people living in war torn countries. Warren County farmers and victory gardeners increased production to feed the troops and starving people; many county residents worked at the munitions plant in Ankeny. Books will be on sale at the Warren County Historical Building during the Log Cabin Festival, September 23-24. 2017. The 2015 LCF Book, Warren County & The Civil War, is printed and can be purchased at the WCHS museum for $30. Add an additional $5 if you want it mailed. Over the past 150 years, thousands of books and articles have been written about the American Civil War. 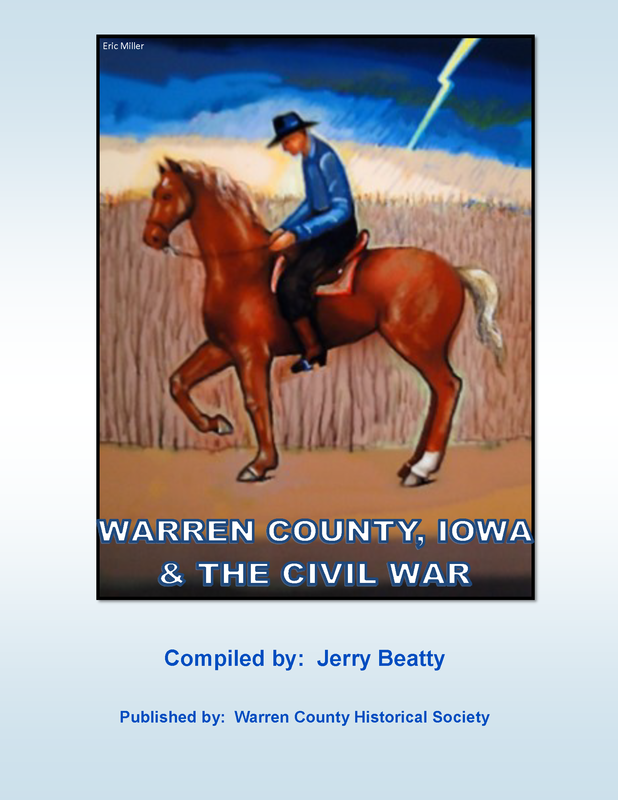 This book has two principal goals: to honor the soldiers of Warren county, Iowa, who fought in the American Civil War and, secondly, to collect, analyze, and preserve information about the involvement of Warren County people in the historical events surrounding the Civil War. This book reviews the involvement of WC citizens in events leading up to the war including the Underground Railroad, aiding runaway slaves, and the struggle between slave and anti-slave factions in the Kansas Territory. The 2014 LCF Book, Agriculture in Warren County, Iowa is printed and can be purchased at the WCHS museum for $30. Add an additional $5 if you want it mailed. It is a 280 page book (More than 200 pictures) The cover art is a water color done by Doris Currier, local water color artist. You can see her lovely painting on the stairwell wall leading to the museum basement. Sadly, Doris passed away . 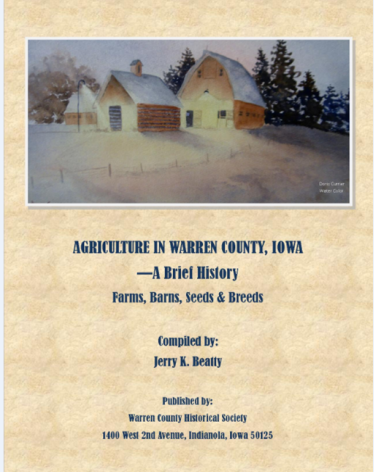 The book describes the settlement of warren county, the impact of mechanization on agriculture, and the evolving development of livestock, crops, and horticulture in Warren County. Among the topics in the book are farm-related organizations and youth groups. The book lists all 142 family farms in Warren County that have received a Century or Heritage designation and the history of many of them. 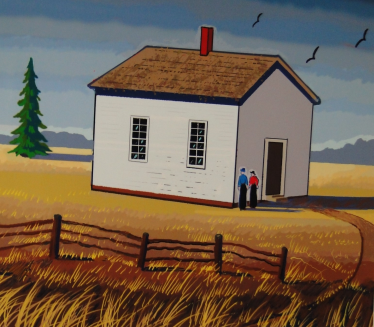 The 2013 LCF Book, Rural Schools in Warren County, Iowa is printed and can be purchased at the WCHS museum for $30. Add an additional $5 if you want it mailed. It is a 250 page book (More than 200 pictures) The School Book features 148 Country Schools and mentions over 4,000 names. Favorites From Warren County Kitchens is printed and can be purchased at the WCHS museum for $20. Add an additional $3 if you want it mailed. 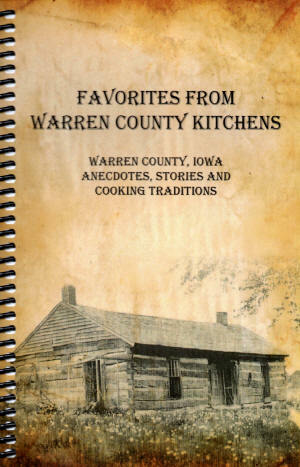 The cook book features recipes from the community including many state fair winners. AShort History of Summerset is printed and can be purchased at the WCHS museum for $15. Add an additional $2 if you want it mailed. This book features the history with maps and photos. Jerry wrote this book in 2011 when Summerset was the featured town for the Log Cabin Days Festival. 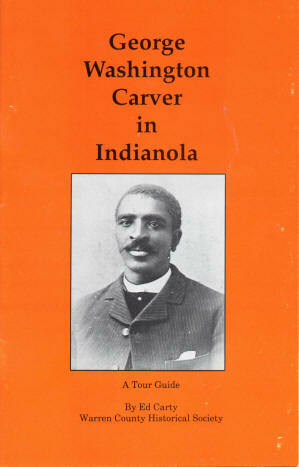 A History of George Washington Carver during his time in Iowa is printed and can be purchased at the WCHS museum for $5. Add an additional $1 if you want it mailed. This book features the history of George Washington Carver during his time in Iowa and how it shaped his future.